Earlier in the week I mentioned how the former Woolworths in Newquay had been divided up between Poundland and Peacocks. 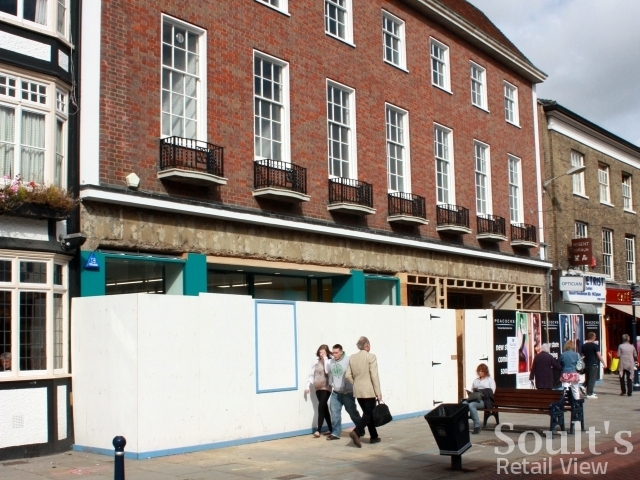 Now the same process is underway in Hitchin (store #452). Steve Hack sent me this photograph that he took in the historic Hertfordshire town yesterday, showing the development of both stores well underway. 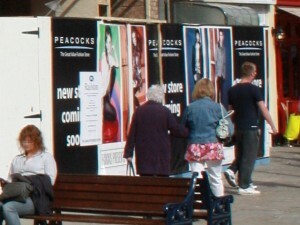 While Peacocks has a poster on the hoardings announcing its arrival, Poundland’s impending opening – set for Thursday next week (29 September) – is given away by the distinctive turquoise paintwork that now adorns the other half of the property. Though I’ve never visited Hitchin, my understanding is that it’s rather an upmarket town, with lots of independent shops and cafés and a low number of empty stores. As Poundland continues to widen its target demographic and approaches a store count of 350 – double the number that existed just three years ago – it’s clear that the chain’s juggernaut of growth shows no sign of slowing down yet.